Super Stickman Golf was one of my favorite titles released last year and now, four months or so later, it continues to be one of the best golf games available on the App Store. This review is long overdue, so with the recent update I figured this would be the perfect time to do so. 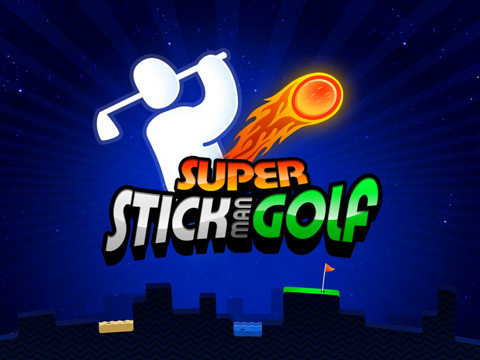 The game, which was originally titled Super Stick Golf (before a copyright issue forced the name change) is the follow up to Noodlecake Games’ popular 2D golfing title Stick Golf (thankfully without the wind component). This is not a traditional golf simulation game, so if you are looking for realism join another club. No slicing, no fading, no yardage calculations, no wind, no heavy bag weighted down with 14 clubs, instead you’ve just got one jack of all trades club and 6 unlockable super clubs (more about these in a bit). In this game there is virtually no such thing as a straight path to the green, there are lots and lots of obstacles that will make it difficult for you to get to the hole, everything from the traditional water hazards and sand traps to the more interesting walls and conveyor belts. To make a shot, you simply line up your directional indicator arrow by using the left and right buttons, when you are ready to swing, you press the “go!” button to start the power meter cycling up and down. When the meter is at the desired level, you press the button again and your shot will go flying. Like any more traditional golf game, the goal is to finish each hole in as few strokes as possible. There are a total of 29 nine-hole courses (261 unique holes!) in the paid version of the game and the free version contains 3 course unique to that release. The paid releases courses are broken down into three tours as follows: all 16 classic courses from the original Stick Golf game, 8 super courses and 5 expansion courses that just arrived with the latest update. Most of the courses are initially locked, requiring players to score par or better on a course to unlock the next course in each grouping. This is nice as it really forces you to improve your game in a trial by fire sort of way. Beating certain courses also unlocks the various super clubs. For those that who don’t want to spend the time working at their game, Noodlecake has just added a way to pay to unlock the additional content/course immediately via in-app purchase. Now about those super clubs… This is one aspect of Super Stickman Golf that really sets it apart from other golf titles on the App Store and adds a lot of fun (and strategy) to the game. There are six of these unlockable power-ups including the MULLIGAN which lets you re-hit a shot, the STICKY BALL which will cause your ball to stick to the first surface that it hits, the ICE BALL which freezes a water hazard on contact, the HAZARD SWAP which swaps all of the sand traps on the course with water and vice-versa, AIR BRAKES which stop your ball in mid-air, and finally the SUPER BALL (which is the most difficult to unlock) which allows you to get some serious distance! Before starting a round, you are able to select up to a total of seven super clubs (from those which you have already unlocked) which can be used anytime during the round. This can be seven of the same club or you can mix and match depending on what you think you’ll need. Since you have less super clubs than you do holes, you need to use them sparingly. Aside from the MULLIGAN, the super club must be initiated before you make your shot and it is swung the same way as your normal club. If you just want to hone your skills or develop your strategy with the super clubs, you can practice any hole from any course, during which you have an unlimited supply of super clubs. Although the classic courses were created before the invention of the super clubs, they actually work really well with them and feel like a natural fit. 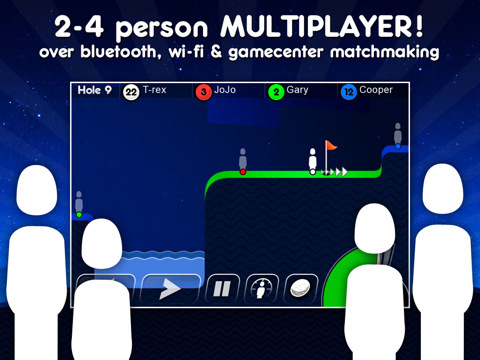 Super Stickman Golf has full Game Center integration for achievements and per-course/per-tour leaderboards, and with the latest update…online multiplayer! You can take on friends and family to see who is the fastest golfer of them all. Yes, that’s right I said the fastest, not the best. That’s because instead of offering the casual turn-based multiplayer outing of a traditional golf game, Noodlecake has one again bucked the trend and gone for a frenetic, real-time, arcade style race to the hole multiplayer format. Playing either locally via wifi or Bluetooth, or online via Game Center’s matchmaking functionality, 2 to 4 players try to stroke it out simultaneously (hmm that sounded a bit perverted). In this multiplayer mode, it doesn’t matter how many times you hit the ball, whomever reaches the cup first, gets the point. This mode is a lot of fun and you’ll quickly develop some Game Center nemeses (wondroushippo I’m looking at you), especially when you just edge out your competitor(s) and your ball rolls in just before theirs. All players are given a lot of 10 special clubs at the beginning of the match and you can select from any of your unlocked special clubs at the time you want to use them, no need to pre-choose which ones. There is an xbox-live style game lobby before the round starts where players can veto courses if they don’t want to play them. I apologize if this review is getting kind of long, but there is just so much to this game that needs to be mentioned and I can’t end this review without giving huge props to the fantastic work that Whitaker Blackall has done with game’s 8-bit inspired soundtrack. Usually I tend to play my game’s with the sound off, but this one I just can’t help but keeping the sound on to hear these catchy chiptunes. Nice job Whit! Not a fan of traditional golfing games? Like your game’s with a bit of character? Looking for something fun and addicting? Then Super Stickman Golf is a perfect choice for you. It is an approachable golf game that can be played by anyone, even if the only kind of golf you are familiar with is of the miniature variety. 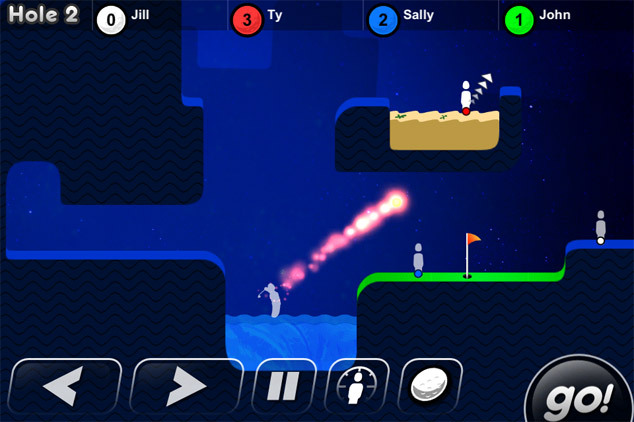 Super Stickman Golf is a fun departure for the golfing genre and the free version should be ‘required reading’ for any iDevice owner. The full paid version is on sale right now for just 99¢, so do yourself a favor and grab one or both versions today, you’ll have a ball! Send me a multiplayer challenge (OTGGamer) and I’ll see you on the links.